Among the thousands in attendance in the first weeks of Del Mar's 79th summer season was an old, familiar face. Fourteen years prior, during the track's 65th summer season, a dark bay Thoroughbred gelding with a star, a stripe and a blaze on his head finished second, beaten by four lengths in the first race of the day on Friday, August 13, 2004. In the aftermath of that mile and one-sixteenth claimer, that horse – a 3-year-old California-bred named Lava Man — was haltered for $50,000 by trainer Doug O'Neill for owners Dave and Steve Kenly's STD Racing Stable of Phoenix, AZ, and Jason Wood of Rancho Santa Margarita, CA. 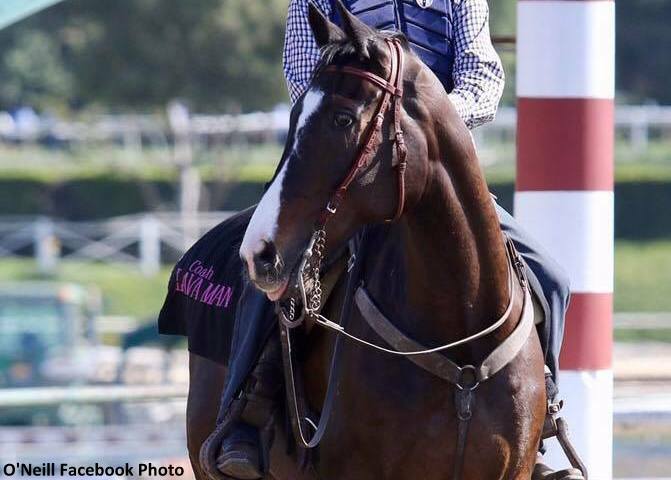 Lava Man would eventually go on to become one of California's most prominent racehorses and the all-time leading earner among all claimers with career earnings of over $5.2 million. Up until recently, the now 17-year-old Lava Man was at Del Mar residing in O'Neill's barn for the track's summer season. O'Neill said seeing him again at the shore oval elicited fond memories. “This is the place that we got lucky enough to be united with him, and to bring him back here at age 17 and see him on the track again was definitely pretty special,” he said. However, on July 31, O'Neill tweeted that Lava Man had had a colic episode which required surgery to correct a twisted intestine. The horse is now recovering at nearby San Luis Rey Equine Clinic in Bonsall, and O'Neill said he and his team are optimistic about his recovery. Being something of a warrior and defying odds seems to be a common theme in the Hall of Fame (inducted in 2015) horse's 47-race career. Foaled in 2001 as an offspring of Slew City Slew, son of Triple Crown winner Seattle Slew, and the dam L'il Ms. Leonard, Lava Man first ran as a 2-year-old in a $12,500 claiming race at the San Joaquin County Fair in 2003, finishing fourth at 36-to-1 odds with a dismal Beyer Speed Figure of 27. But he'd managed to work his way up to three firsts in 12 starts before being put up for claim that day at Del Mar by former part-owner and trainer Lonnie Arterburn. The now-famous $50,000 snag by O'Neill and his team has since been cited by many as the single greatest claim in horse racing history. “History is not one of my strengths, but I would say in my personal history he's the greatest claim ever,” O'Neill said. Two years later, in his 2006 campaign, 5-year-old Lava Man racked up seven simultaneous Grade 1 wins in California, including the first sweep of the state's big three races for older horses – the Santa Anita Handicap, the Hollywood Gold Cup and Del Mar's Pacific Classic. By the end of his seven-year-long racing career in 2009, he had 17 wins, including 13 stakes victories, along with eight seconds and five thirds. He scored nine triple-digit Beyer Speed Figures and set two track records over the span of his remarkable career. Veteran Corey Nakatani, the regular rider for Lava Man who handled him in each of his seven 2006 Grade 1 wins, maintains he was one of a kind, rising through the ranks to high esteem. Even off the racetrack, Lava Man is considered extraordinary by those who know him. Leandro Mora, O'Neill's assistant and right-hand man who has known Lava Man since the 2004 claim, said that the nickname suits the horse well. Lava Man's leadership and “coaching” abilities were best exemplified in 2012 when I'll Have Another, the first horse he got to pony, won the Kentucky Derby and Preakness Stakes. “Coach” Lava Man was with him every step of the way, O'Neill said. “I really think he gave I'll Have Another the confidence he needed to excel under those pressured situations. He's really a great role model and great mentor,” he said. With Lava Man recovering from his colic surgery for the next few months, Mora said the horse likely will be kept away from the racetrack for the time being. However, he couldn't be sure how long he'll be able to resist the lure. McDowell, a May graduate of San Diego State University, is one of seven young people working at Del Mar this summer under the track's 41-year-old college intern program. This entry was posted in Horse Care, NL List and tagged colic, colic surgery, Del Mar, doug o'neill, Lava Man by Julianna McDowell/DMTC. Bookmark the permalink.